"Our program is a journey by rail, through history and around the world. It tells the story of one invention, and its immeasurable effect on civilization as we know it...when the railroad appeared, the world became a very different place." With today's North American society relying on automotive and air travel as the primary means of transportation, the role of the railroad in everyday life has been pushed to the background. What many may not realize is that without the railroad, our society would not be what it is today. The railway is responsible for facilitating the modernization of the globe, from the birth of the industrial revolution to the settlement of the continents, none of which would have been possible without it. The first locomotive was designed by George Stephenson in 1825, as a more efficient and cost effective replacement to the coal ponies working the collieries of Northern England (The Littlest Horse Thieves was set during this transitional time). Within a few decades, railroads crisscrossed England, enabling the industrial revolution to take place, as factories and their customers could now exchange goods over long distances, and the technologies used to develop the railways, went hand in hand with modern factory developments and large-scale manufacturing. In North America, the railways were solely responsible for the settlement of the outlying country, with rail companies actively recruiting settlers from the eastern United States and all over Europe. It dictated where towns were born, and with an 1800 mile stretch of track joined the east and west coasts of the continent. This series for the History Channel features four programs on the history of locomotion, and takes a look at how it has helped shape our contemporary world—the good and the bad. Narrated by Edward Hardwicke, we travel around the globe, learning the history, and the modern role trains and railways play in our lives. In volume one, Engines of Enterprise, we see the effect of the railroad on North American settlement. The railroad opened up the west to settlement, and became the first big business in the new world. With it came tremendous riches and power for the rail owners, and here the story of the rise and fall of the railroad barons is told, through archival footage and interviews with historians. Volume two, Taming the Iron Monster, takes us back to the origins of the locomotive in England, where rising forage prices caused by the Napoleonic wars required a solution to the conventional mining system of horse-drawn coal cars. While the steam engine solved a lot of the problems with using live animals for the work, there were unforseen problems that made early steam engine life perilous. The terrain also posed many problems that horses had long overcome. As the railroad became a way of life, its acceptance wasn't always in favor. How these issues were finally resolved, and how they remain even today, is the focus of this program. In volume three, we see how the locomotive not only changed the way mankind lived, but also how it enabled them to create war on a far greater scale. From its first uses in the American Civil War (ultimately becoming the deciding factor), to its role supplying the front lines and transporting men, machinery and prisoners in World War II, The War Machine chronicles the locomotive's part in the darker side of our history. We again see archival film, interview footage with many participants in the world wars, and footage from the 1952 Soviet film, Road of Glory, based on the life of female engineer Yelena Chukhnyuk, who also appears in a contemporary interview. We learn how the wars were won, and lost, on the rails. Finally, in Magic Machines and Mobile People, we look at the use of trains today, while also looking at how we got here. From the development of Grand Central Station in New York City to the bullet trains of Japan, we see how trains play a part in today's society, and the problems railroading faces in the modern age. 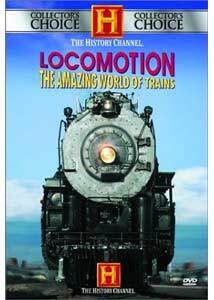 This series provides a fascinating look at the world of locomotion, its history and its uses. Unfortunately, A&E doesn't list how many episodes there are in total for this series, despite listing credits for installments not featured on the disc—I do hope we get more offerings, as this was quite enjoyable, if incomplete, as is. I would have preferred more of a chronological look at the history of trains, rather than the way this was presented, primarily to gain a better perspective on the historical timeline; but with the four programs on these two discs, we do get a good introduction to what the locomotive has meant to the development of our modern world. I'd recommend this for anyone interested in the subject. Image Transfer Review: The source material for this series is a collection of archival footage and modern taped segments. The image quality of the older footage varies greatly, and contains the types of print defects expected in film of this vintage, although usually in pretty good shape from a tonal perspective, damage excluded. The newer footage, especially the indoor interviews with historians, is often shot on location, and it doesn't look like much concern was placed on proper lighting or color correction, as each segment tends to look somewhat flat with various hues skewing the coloring. Encoding quality looks pretty good, with the series split onto two discs. There are grain issues present which don't look wholly natural, but overall this doesn't look at all bad for a TV documentary series. Audio Transfer Review: Audio is presented in stereo, though the soundscape is primarily center focused for the narration. Audio quality is as expected for a TV show, dialogue is clearly audible, with background elements not being too terribly dominant in the mix. Noise or other technical defeiciencies aren't present, so I'll give this one a pretty decent grade compared to similar programming. Extras Review: An advertising leaflet showcasing other A&E offerings is the only extra. For those with an interest in the locomotive and its history, this series provides an interesting look at the railway around the world. Well written, and composed of archival and modern day footage, I thoroughly enjoyed all these programs and hope we'll see more from Locomotion: The Amazing World Of Trains.